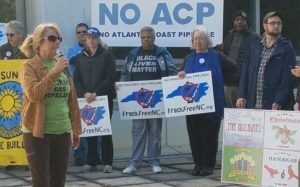 The Atlantic Coast Pipeline (ACP) is a proposed highly pressurized natural gas pipeline planned to go through WV, VA & 8 eastern NC counties (Northampton, Halifax, Nash, Wilson, Johnston, Sampson, Cumberland, Robeson). 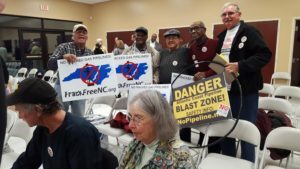 The pipeline would enter NC in Northampton County, where a large compressor station would be built, and end in Robeson County, near Pembroke, with an extension to Hamlet via the Piedmont Connector Pipeline, and possibly into SC. 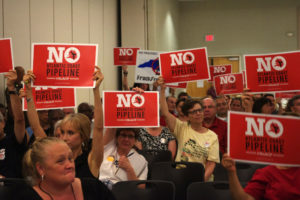 The pipeline would be nearly 600 miles long, and the cost of the project would be over $7 billion, to be paid for by YOU (NC electric ratepayers)! 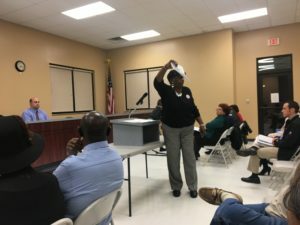 How to Help Stop the Pipeline? Sign up here for weekly Pipeline & FrackUpdates for the latest news, commentary, and action alerts. 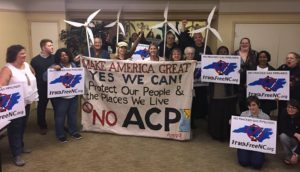 Go to this link, and fill out a digital postcard telling Governor Cooper NO Atlantic Coast Pipeline!